Then Sister Stepped In | Are You Zhazha? Nate’s first lost tooth took its sweet time to open up a vacancy and when it finally did, it departed in a very special way. I tried to help it find the exit but Nate’s whimper made me chicken out. I then (jokingly) suggested to Nia, “Why don’t you try?” Little brother actually liked that idea and Nia didn’t hesitate. She took the paper towel I had and walked right up to that tooth … “There you go,” she casually stated. No big deal. 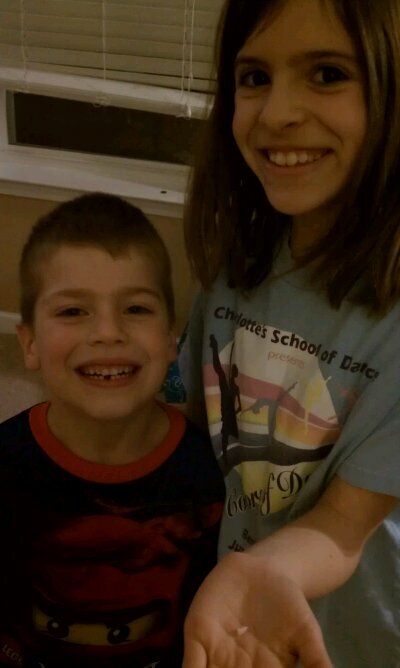 I just pulled my brother’s tooth. He didn’t flinch or even make a noise. He trusted her completely. All the other teeth need to take note. No point in hanging around too long. The big sis will get you.